(Bloomberg) -- The best quarter for U.S. stocks in a decade has come to a close, but signs are emerging that appetite for risk may have room to grow. It’s apparent in the rush of investors trying to get access to growth stocks, a strategy that got pummeled in the fourth-quarter meltdown. 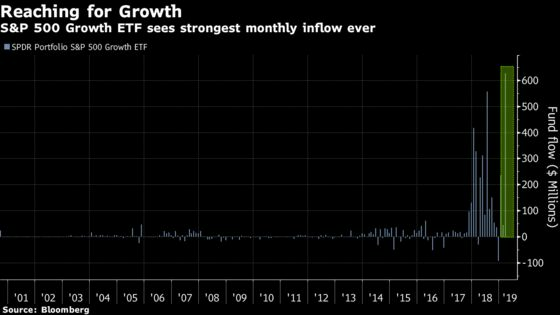 The $4.54 billion SPDR Portfolio 500 Growth ETF, ticker SPYG, took in nearly $630 million in March -- the largest monthly inflow on record for the almost 19-year-old fund. That happened as the S&P 500 Index rounded out its strongest start to a year since 1998, with SPYG outperforming its value counterpart by more than two percentage points. Money initially flowed into safer areas such as low volatility stocks and fixed income, but now that caution may be fading. The Federal Reserve’s change of course in January has ushered in a period of lower-for-longer interest rates. Inflation remains steady while data show the global economy is slowing, but isn’t yet recessionary. That’s helped push technology companies to the best-performing spot in the S&P 500 this year, up more than 20 percent. It’s a change from the fourth quarter, when the industry was the third worst. One-fifth of SPYG is comprised of technology companies, with the popular FANG cohort making up a sizable portion. In fact, Microsoft Corp., Amazon.com Inc., Facebook Inc., and Google-parent Alphabet Inc. account for nearly 22 percent of the fund’s holdings. While the growth fund is already up more than 15 percent this year, some strategists say there could be more room to run.